Both Rich and I grew up with brothers, so it's a unique thing for us to witness a sibling relationship that doesn't involve a boy. And I confess I'm super excited to get to watch this relationship grow and change over the years. 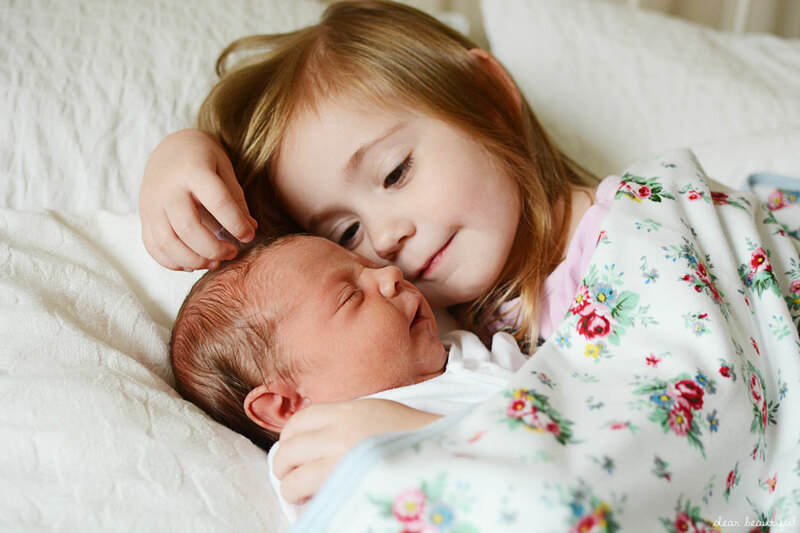 I loved growing up with a brother, and I love watching the big brother and little sister dynamic between my oldest too, but watching sisters will be an entirely new thing for me. And if early indications are anything to go by, I think these two will be thick as thieves. 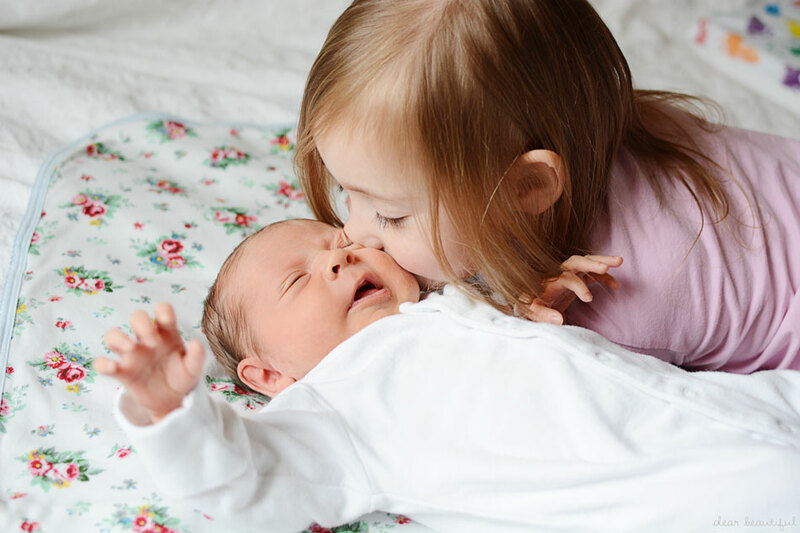 Our littlest girly gets utterly spoiled with love and attention from her sister, and I think with a big brother away at school so much of the time, that these two will have the time to develop a really special relationship. We're still at the stage where we have to regularly remind our biggest girl to use gentle hands and a quieter voice at times, but truth be told, I'm pretty sure the new addition is already totally in love with her wild and carefree sister; the one who wants to entertain her at every nappy change, who loves to give her all the toys, and will ask repeatedly "can I take her now?" We have always joked that our beautiful girl was born to be a middle child, and born to be a big sister. There is something about her nature that just makes her perfect for that role in our family. 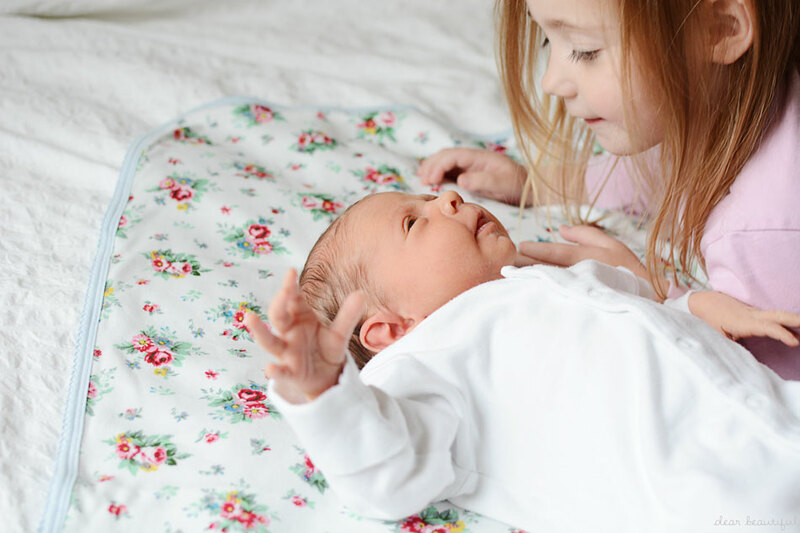 She is such a little mini-mummy, so often seems like she is much older than she actually is, and she is naturally so nurturing and affectionate; and so far she's totally rocking her new job as big sis. And can we just take a minute to appreciate the gorgeous flowery goodness of this baby blanket... I'm totally in love with it. When you have baby girls, but are naturally averse to pink, you get pretty creative at picking out girly things that avoid the stereotypical pink. I hate the thought that people would mistake my gorgeous baby girl for a boy, but then I also picked out a blue car seat for her... so a pretty blanket is kind of a must. This one came from Little Chickie, who kindly sent us this blanket and also a gorgeous sleep suit that I can't wait for my little lady to be big enough for. Little Chickie is a lovely online store full of beautiful items for babies and toddlers; clothes, blankets, and all the other baby essentials that you might expect like bibs, muslins and socks. They really do have a lovely collection of things, so go and have a browse... I had a tough time choosing what to try out with our little lady because there are just so many lovely items. But this blanket was definitely a good choice. We use it all the time... in the bouncy chair, in the car seat, as well as for sisterly cuddle time. It is a gorgeously soft jersey fabric, and a lovely big size too. And it washes up fantastically (very important for anything for babies I'm sure you'll agree), in fact I think that washing it has made it even softer. And it's beautiful. I'm a sucker for it's floral print and pale blue backing, so girly and classic without that hefty helping of marshmallow pink. So cute. Love the pictures I have that feeling about my youngest - born to be a middle child. But not yet. All of the beautiful girl is clearly adoring being a big sister :-) it's funny, I'm the same but opposite, my experience is of being one of two sisters so I knew roughly what to expect with my two biggest girls, for me the surprise has been watching my little boy fit into the mix and it is lovely watching them all work out their relationships together. Ahhh what gorgeous captures of the beginning of a life long love of sisters. I love the dynamic between sisters and I grew up with an older sister so I know what it feels like. It's magical. I think it would be different than watching our brother/sister bond of my two and your eldest so I love seeing it with your little girls. Too cute. Making my heart melt here Lucy.... and broodiness is killing me!